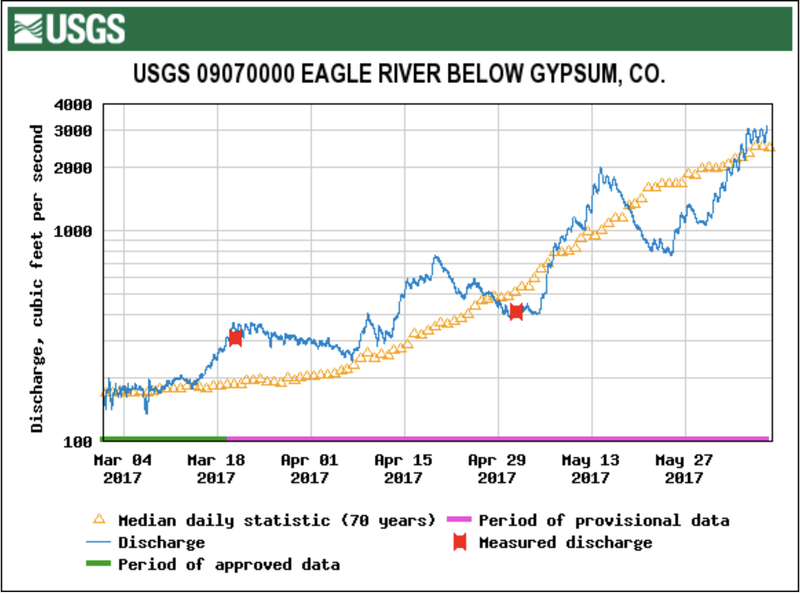 A cool month of May suppressed local runoff and streamflows. But recent warm weather, with more sunshine in the forecast, may bring streams to peak runoff in the next several days. Keeping safe on local streams is an all-the-time thing. Current conditions should soon turn more friendly for casual float trips. Boyd, a valley native, said he looks every day from his home in Avon up to Game Creek Bowl on Vail Mountain. The bit of snow remaining on that slope means there should be a little more room for higher streamflows, he said. Pete Wadden is the town of Vail’s water quality education specialist. Unsurprisingly, Wadden is also a boating enthusiast. Wadden has only lived in the valley for a few years, but looking at this year’s snowpack — bolstered by a large May snowfall — as well as the weather forecast for the next several days, he believes local streamflows should peak soon. Boyd said he thinks streams will peak during the weekend. Wadden thinks the peak will come within the next 10 days or so.